After months of hints, leaks and speculation – the time has come for the debut football boot releases from Warrior, and we think many of you are going to be instantly happy with the Warrior Skreamer K-Lite! One of two top-tier releases based on the all-new Skreamer silo, the Warrior Skreamer K-Lite are a boot that offer exceptional technology and innovation in a crowd-pleasing K-leather package. 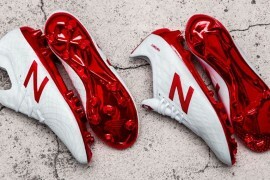 As this is Warrior Sports’ first entry into the football boots market, we’re thrilled to say there’s plenty being brought to the table by the brand, who are offering a combination of tried-and-tested features, striking new innovation and ‘where have you been all my life?’ ideas and tweaks on the Warrior Skreamer K-Lite. Starting with the upper, the Skreamer K-Lite goes down the route of boots like the 11pro SL and Mizuno Morelia Neo by packing a K-Leather forefoot and vamp, which transitions to a weight-saving microfibre midfoot and heel. 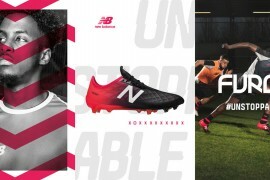 As has become the standard for many modern football boots, the Warrior Skreamer K-Lite boasts a side offset lacing system, creating a massive striking and passing area on the instep and forefoot for consistent contact with the ball. Whilst many football boots have put less emphasis on heel protection, the HeelShield heel counter is one of the headline technologies on the Skreamer K-Lite, using uniquely-shaped Pebax that works seamlessly with the soleplate to create a ‘slashproof’ construction. 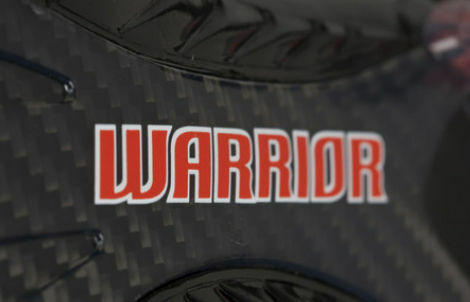 Speaking of the soleplate, Warrior bring two signature technologies into play in this department; the curved ‘ClawTec’ blades on the FG model are curved for optimum grip and release (the SG model uses a classic six-stud config with hollow-point aluminium studs) and a Carbon Fibre X-Bow Shank that supports the foot where it needs it most, and offers optimal energy return. 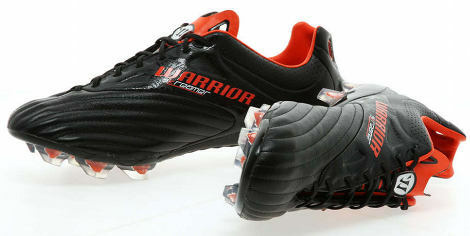 Similar to fellow Americans Under Armour, Warrior have also placed a huge emphasis on player comfort. The cut-outs you see on the achilles and tongue aren’t just for ventilation; dubbed ‘Murderholes’, these cut-out sections of the boot are perfectly sized for fingers, allowing you to adjust the boot if it’s scrunched up – even when the laces are tied. On the inside of the boot, the Warrior Skreamer K-Lite utilises SkreamFree construction – which means there is zero internal stitching to rub against the foot for improved comfort. Additionally, the textured Arrowbed insole improves circulation and reduces food slippage. 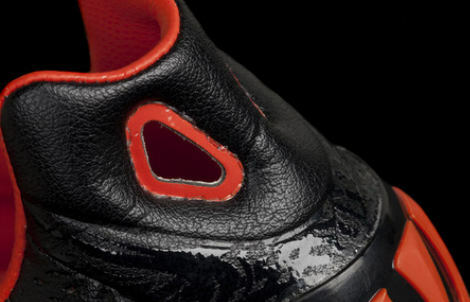 Seen here in the launch Black/Spicy Orange colourway, the Warrior Skreamer K-Lite will cost £130 for both the FG & SG models when it launches on December 7th 2012. We’ve got to say, £130 for a K-Leather, Carbon Fibre soled-boot is definitely a good price point to kick things off from Warrior – but what do you guys think? looks very nice, the k-leather section reminding me of pele sports. two things worry me though: those holes on the back, which might cause slippage; and the big warrior skreamer label in the instep, looks like a cheap sticker. im concerned with forefoot flexibility. realy cool boots! 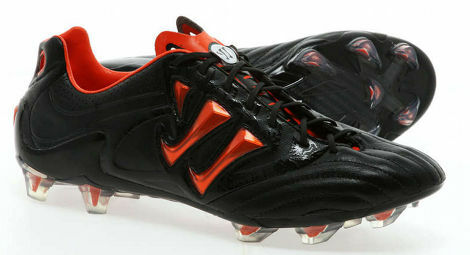 but the appeal of the black/spicy orange colourway doesnt realy look modern enough for this boot.